The lives of teenagers are the focus of several Canadian entries in the Toronto International Film Festival, with filmmakers drawing on their own experiences from the past and those they see unfolding today. For Toronto’s Kate Melville, the process for putting together Picture Day began when she was in high school, the same age as the protagonist featured in her debut film. "I first actually invented these characters 20 years ago when I was in high school, so it’s a coming-of-age film that I’ve had to grow up with," Melville told CBC News, following TIFF's announcement of this year’s Canadian lineup. The story centres on a high-school student named Claire who ends up doing the victory lap, a repeat of her final year. And while Melville says Picture Day is a coming-of-age story, it is also about the city where Claire lives — Toronto, which is not coincidentally the hometown of the director. Tatiana Maslany plays the lead role in Kate Melville's Picture Day, a film about a teenage girl who is in the midst of repeating her final year of high school. Shot in real Toronto schools, clubs and other locations that Melville personally scouted, the film "ends up being a story of someone growing up in a city, but also a story of the city itself." A past opportunity had come up to make the film in Los Angeles, so as a result, she spent time trimming out the elements that made it Toronto-centric. "I had this heartbreaking process where I had to go through and take out all the identifiers that made it a Toronto story," she said. But in the end, a story that began in the mind of a Toronto teenager was made in the same city where it was conceived. For co-directors Jason Lapeyre and Robert Wilson, their I Declare War, also showing at TIFF, is "about a dozen kids playing a game of war in a forest and imagining that they have real guns," said Lapeyre. "But the film is about being a teenager, it’s about being a young person." Lapeyre wrote the script 10 years ago, hoping to tell a kind of story that he says rarely makes it to the screen. "I just wanted to write a story that told the truth about what it was like to be that age as opposed to the representation of that age that I saw in a lot of other movies," he said. "And I wanted to tell a more authentic story about being that age." Wilson said the script won him over easily. They shot the film in woods in Scarborough in east-end Toronto where he himself played the same game as a youth. "I read the script and said, 'We did this. This is exactly what it was like. We have to make this,'" said Wilson, who, like his co-director, disdains the kinds of Hollywood films that are typically made to sell to teen audiences. 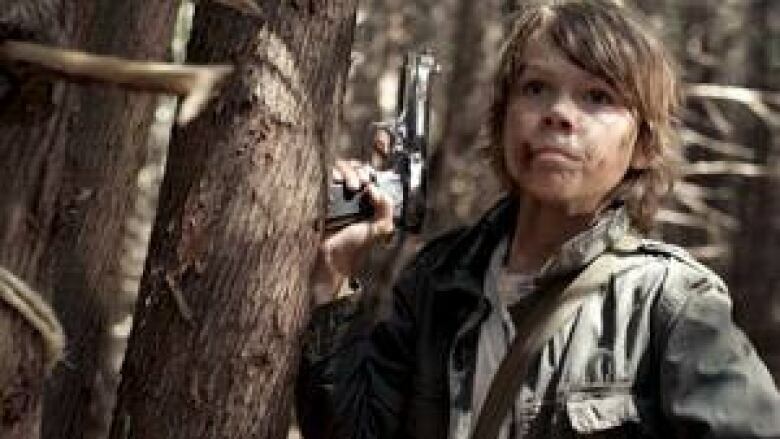 Pointing to Richard Donner’s The Goonies and Rob Reiner’s Stand By Me as like-minded films to I Declare War, Wilson said he and Lapeyre are making a film imbued with teenage feelings, at a time when many films are most informed by market expectations. "There’s a sense out there now that kids aren’t just kids any more. They’re specified," he said. Jason Buxton’s Blackbird tells the story of a teenage boy from a small town who is going through a difficult time in his life. He is being bullied and he is angry. And out of the anger he feels about his situation, he makes a threat over the internet. "It’s a coming-of-age film. But beyond the setup of the film, it goes on to explore deeper issues — loss, isolation, it also looks at at-risk youth," said Buxton. Shot in Nova Scotia, Blackbird does not have a definitive setting, other than it is supposed to be in a small town in North America. Because it’s the type of story that could take place anywhere. As Buxton describes it, the young man at the centre of Blackbird ends up being falsely accused of planning a "Columbine-style massacre," the kind of event that viewers have seen off-screen repeatedly over the last decade. But the story being told in Blackbird is also about the world young people are growing up in today, where things that are said online can have real consequences. Buxton said that when he was younger, a threat made to another teenager was often yelled from the window of a passing car. And that was that. If the same threat is made on the internet today, it can yield an entirely different reaction. "We’re in the infancy, it’s all new. We haven’t caught up with it quite yet," Buxton said.